7:30am - Today, Ms. Wagner's day starts with Early Bird! She has office hours for parents available at this time most days of the week, but today she is watching the students who have arrived before the school day begins. 8:00am - Early Bird is over, and Ms. Wagner has work to do. She makes sure her "Do Now" assignments for all classes are organized and finishes up some grading. The homework packets she creates for distribution each Friday are all finished, so she doesn't have to work on those today. As a Humanities teacher, Ms. Wagner covers everything from language arts to history to social studies with her students, and creating a comprehensive curriculum requires lots of advance planning and organization. She's more than up to the challenge! 9:55am - Ms. Wagner's first class of the day begins shortly, so she goes to her classroom to set up. After distributing today's "Do Now" assignment and making sure everything is in place, she's ready to teach. 10:05am - The first grade Nitrogen class arrives! They are taking their first Humanities test of the year and the students are nervous. Ms. Wagner explains the test format before she hands it out, answering questions about the expectations for each test section. Before the test begins, students go to the reading corner to pick a book to read once they have handed in their test. 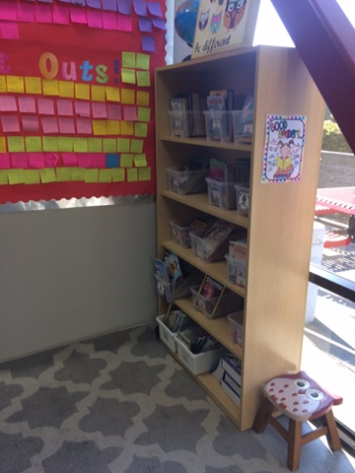 Ms. Wagner has organized the reading corner by reading level and subject so each student can find something they are interested in reading. "I've always thought it was important for students to have access to books they'll love," Ms. Wagner says. "If they find books they love, they'll learn to love reading!" Books selected, the students return to their desks and begin the test. Ms. Wagner and Ms. Sutherlin, the class Learning Expert Teacher, walk around and answer questions the students have about the test. They read questions out loud to some students, and re-contextualize difficult vocabulary for others. They don't give away any test answers; their focus is on making sure the students understand what they are being asked. As the students finish their tests, Ms. Sutherlin begins to grade them while Ms. Wagner continues to supervise the students still answering questions. Many students are quietly reading so they won't disturb the test takers. 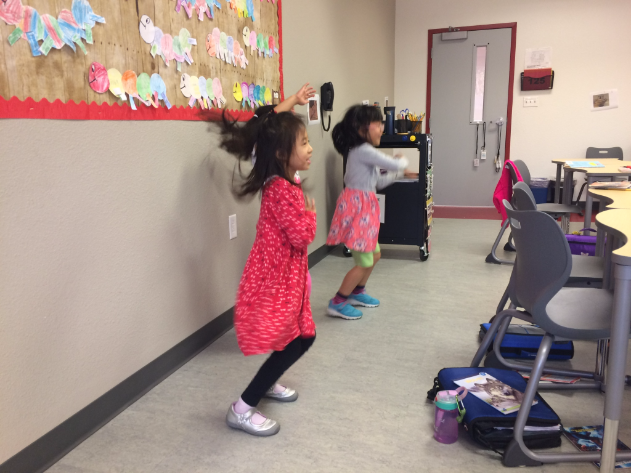 Once every student is finished with the test, the students have a brain break! The class watches a fun video about bones so they can stand up and dance around. 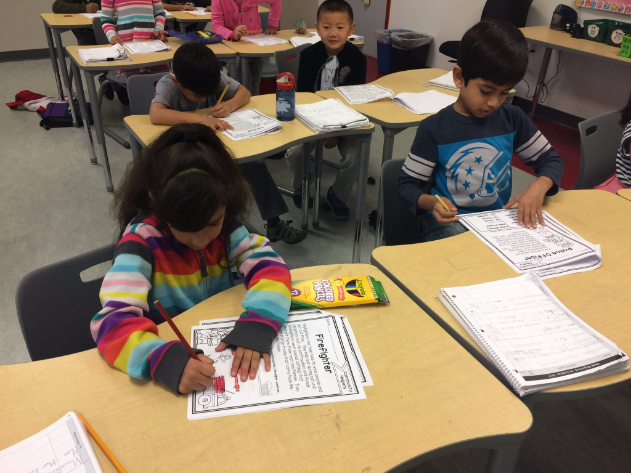 With the remaining class time, the students work on a packet about community helpers. The first graders are learning about jobs in the community that focus on helping others, such as doctors, police officers, firefighters, and teachers! 11:30am - Class is over. Ms. Wagner has time now for a lunch break, and to get more work done in her office. 12:35pm - Ms. Wagner sets up for the next first grade class. 12:45pm - Ms. Wagner welcomes the first grade Carbon class! They are taking the same test that the Nitrogen class took earlier in the day. But first, they have a "Do Now" activity going over "SH" sounds. After the "Do Now" is complete, Ms. Wagner goes over the test like she did for the Nitrogen class. She reviews the format and the expectations before distributing the test. Once all the papers are handed out and the test begins, there are more questions from the students. Ms. Wagner and class LET Mr. Wagoner walk around quietly answering what they can. "Sometimes if I'm stuck on something, I'll move on so I don't get frustrated. Want to try that?" Ms. Wagner says to a student struggling with a question. 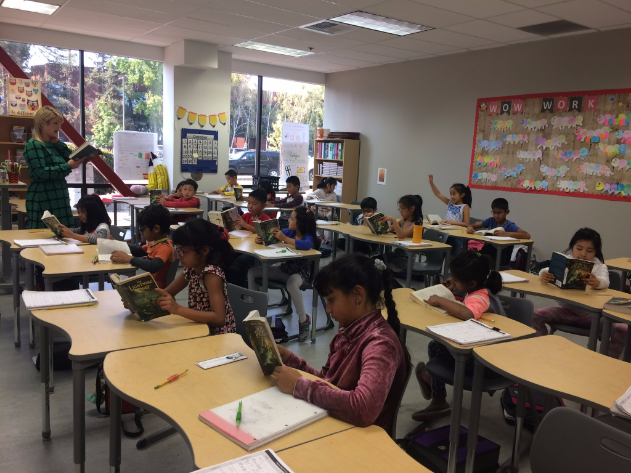 The students begin to read as they finish the test, and when the whole class is buried in a book, Ms. Wagner calls for a brain break. The bone video is played and all the kids get up and move around to get re-energized for the next part of the lesson. "Who can give me an example of a service?" Ms. Wagner asks as she passes out packets about community helpers. The students give a variety of answers, and if they answer with a response that isn't a service, Ms. Wagner asks follow up questions about the roles so the students have more context to think through. 2:10pm - Class is over! Ms. Wagner has a few minutes in her office to organize for the next class. 2:30pm - Ms. Castilla's third grade class arrives at Humanities. Their "Do Now" worksheet today is about distinguishing between plural/singular nouns. Time to read! The class is on chapter nine of The Lightning Thief. Students take turns reading a few pages at a time so the whole class can follow the story at the same pace and ask questions as they go. "What was the summary of chapter nine?" Ms. Wagner asks at the conclusion. Hands fly up in the air as the students review what they just read. "So, the characters are starting a quest. What is a quest?" she asks. Students find synonyms that match the word, but there is more vocabulary to be addressed. "What's a drachma?" they ask. "We can use context to figure this out!" Ms. Wagner says. The class re-reads the passage including this word, and decides that "drachma" means "money" in the context of the story. Class fittingly ends with a packet about conclusions. 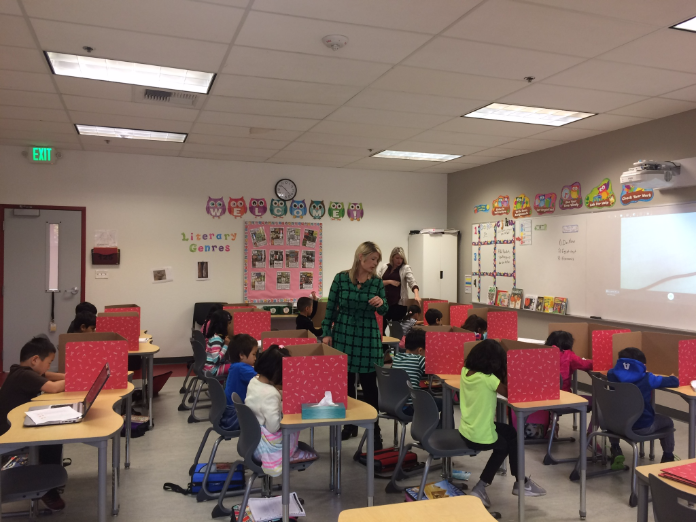 There's still a bit of class time before students are dismissed once they have all completed their work, so Ms. Castilla and Ms. Wagner supervise a game of 7-Up! 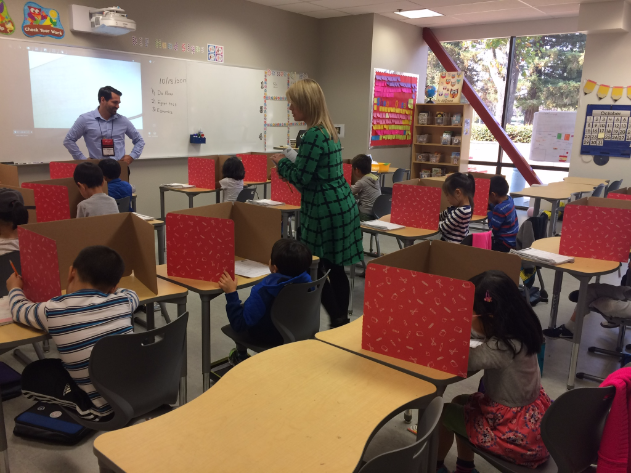 Students put their heads down on their desks and put their thumbs up, and several designated pickers walk around the class selecting thumbs to put down. Students with their thumbs and heads down have to guess who put their thumb down. It's a great way to practice following directions and take another brain break! 3:50pm - Class is over. Ms. Wagner re-sets the classroom for tomorrow and tidies up. 4:15pm - Ms. Wagner has office hours today, so she returns to her office for pre-scheduled meetings. 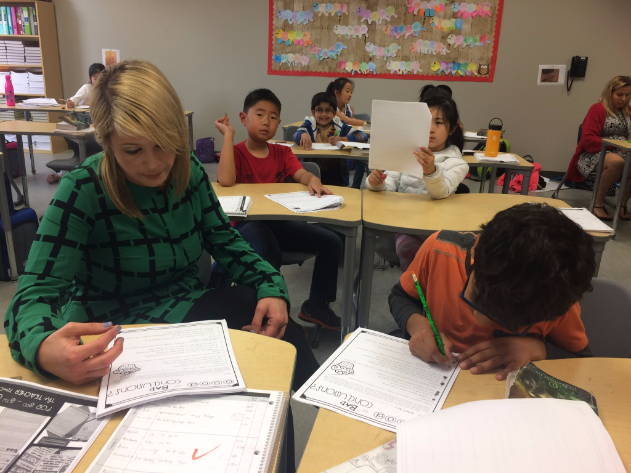 As a Subject Expert Teacher, Ms. Wagner is able to totally focus on her field of expertise and channel all of her energy into creating exciting, relevant lessons that are engaging for her students. Because she teaches multiple classes in the same grade the same material, she has a big-picture view of how the whole grade is doing in her subject, and can work with all LETs in a grade to make sure each student is on track. 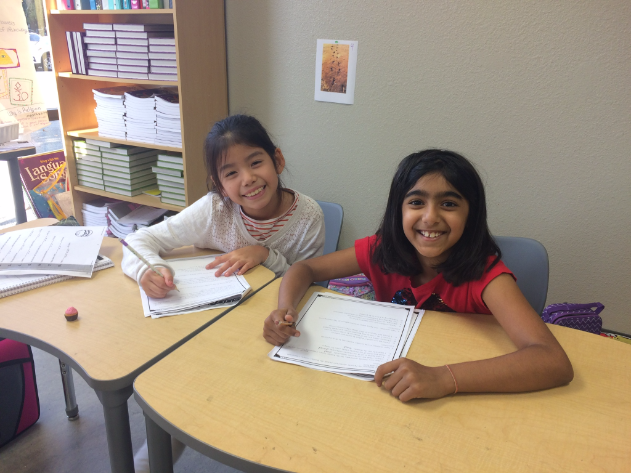 "Our Subject Expert Teachers have genuine passion for their subjects, and that resonates with students," says Dr. Ashley Leyba, Head of School at BASIS Independent Fremont. "If a teacher is excited about what they are teaching, students will be excited about learning! We are creating a positive, enthusiastic environment where students can see each subject presented in the best possible light."